Computer Adventures – Bits, Bytes & Bots participated at the Technology Summer Academy funded by Ossining Matters Foundation. About 16 Middle Schoolers have a fun and education experience with the robotics classes that we offered. 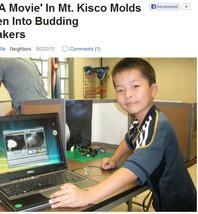 Computer Adventures – Bits, Bytes & Bots summer camp story was featured in today’s Mt. Kisco Daily Voice e-newsletter. Click on the image on the right to view the article. We are on NBC news!